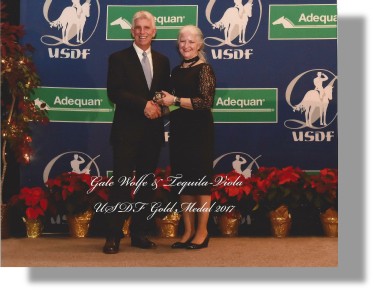 I am Gale Wolfe, owner of Gale’s Equine Facility. I am going to share some history with you. I signed the lease with the owners of the beautiful stable known as “Hunter Run” in the fall of 1988, and officially began the operation known as “Gale’s” in January of 1989. 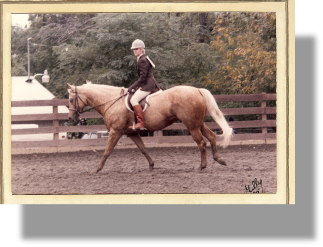 I was, at that time, still competing at the amateur level on the Palomino horse show circuit, and therefore I decided not to teach riding lessons which would have made me ineligible for the amateur classification. So, at first, the facility offered only boarding of horses. 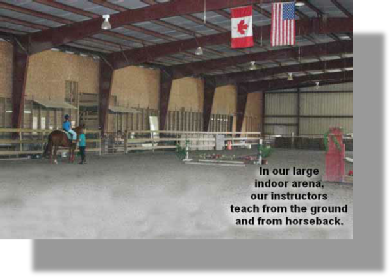 In the years to come, the interest in riding lessons grew and a lesson program was started with the assistance of existing local instructors. The program became successful enough that I offered to purchase the facility from its original owners. The sale was arranged and a closing date was set for the middle of March of 1994. 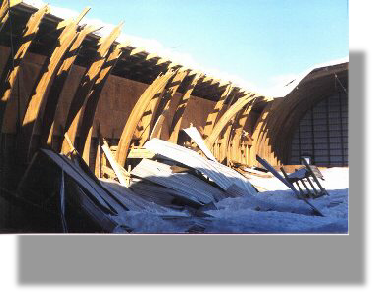 All was moving along well towards the sale closing, until an unusual snow fall caused the collapse of the beautiful wooden arched indoor arena portion of the complex, putting a hold, then, on the purchase. However, matters were worked out, and I concluded the purchase of the facility and had constructed a new indoor arena, made of steel columns and beams. Then having completed my Amateur Championship on the Palomino Circuit with my horse “Neet Gold Package”, turned in my amateur card, and began teaching lessons. 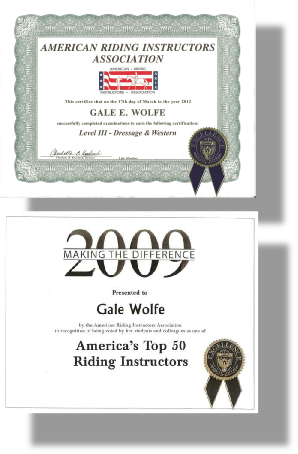 In March of 1999, I earned my first certification with the American Riding Instructors Association, becoming certified at Level III for two disciplines: Hunt Seat and Recreational Riding. Through years to follow, I renewed my ARIA certifications and added the disciplines of Western, Dressage, Eventing and Carriage Driving to my certifications. Twice, I have been named as one of the ARIA’s top 50 instructors. 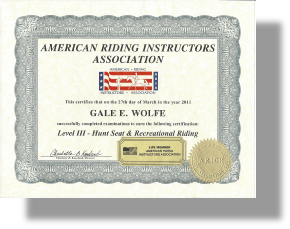 I am now permanently certified by the American Riding Instructors Association at Level III for Dressage, Hunt Seat, Western and Recreational Riding disciplines and at Level 1 for Eventing and Carriage Driving. produced two magnificent foals, “Timothy fan Gale’s” and “Whisper fan Gale’s”. 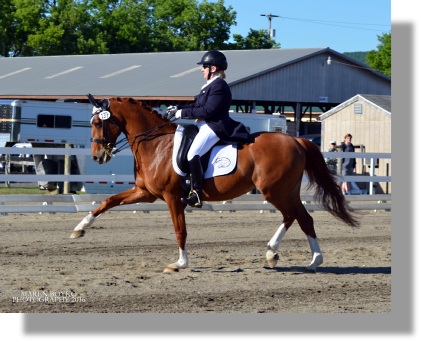 After motherhood was behind Beike, she became my main mount to start competing in the USEF and USDF world of dressage, starting out at Level 4 in 2009. 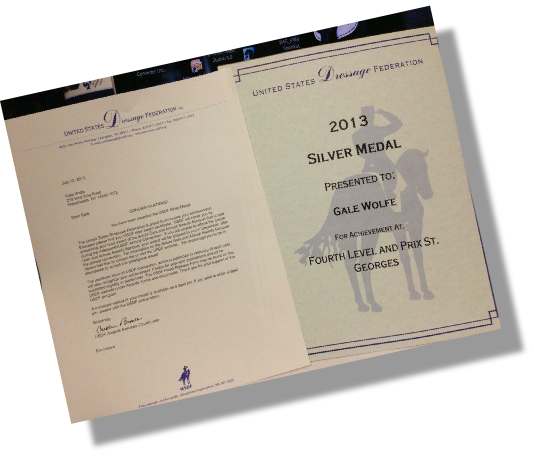 After taking time out to develop my lesson business, I moved into the Prix St. George level, and completed the requirements to earn a Silver Medal from the USDF in 2013. This couldn’t have been accomplished without the support of my family, my clients and good friend, Miek Reitsma, Beike’s original owner. 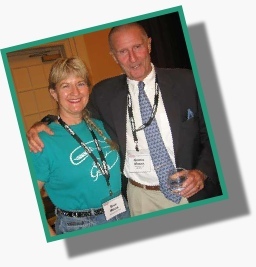 Mr. George Morris was at the ARIA conference in 2009 at which I was presented the “Top 50 Riding Instructors” award. At the time of this writing, Mr. Morris is the chef d’equipe for the United States Equestrian Federation Show Jumping Team. I am very proud of my certifications. 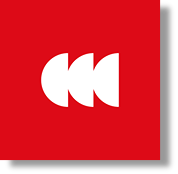 Click “here” to read about my ARIA certification. But….. I’m not stopping at the “Silver Medal”. In 2014 I attended and graduated from the intense USDF educational curriculum known as the “L Program”. 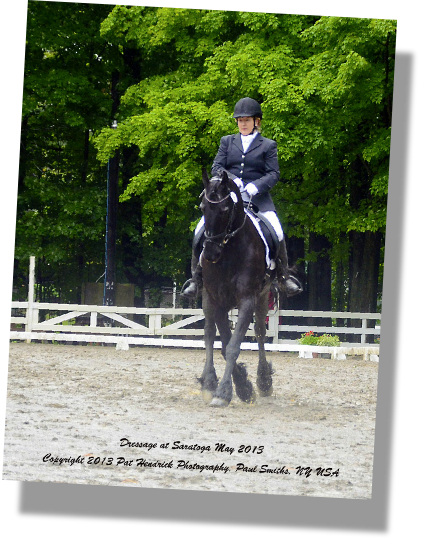 The “L Program” is the first step to becoming a licensed judge of dressage for the USEF/USDF. With the help of my friend, Pam Schneider, who volunteered to be my scribe during the program’s six weekends during 2014, I graduated from the program. As an “L Graduate” and silver medalist, I am knowledgeable enough to teach and judge dressage through fourth level, however, I am not yet, a licensed USEF judge. There are more requirements yet for me to accomplish to get that recognition. In 2016 and 2017, I trained with the Dutch Warmblood mare, Tequila Viola, and earned the USDF Gold Medal. I continue to train on Tequila to develop a Freestyle that we will both enjoy performing. What’s next? Attending more instructional symposiums, and sharing my knowledge with eager students who want to learn how to ride horses. Just for added information, my horsemanship career has not been the only “occupation” in my background. I graduated as Salutatorian of my Horseheads High School Class. 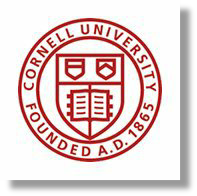 I attended Corning Community College and Cornell University to earn my B.S. 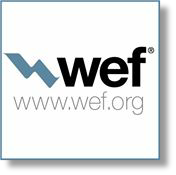 Degree in Civil & Environmental Engineering as well as a Masters Degree in Engineering from Cornell. Of interest, during my academics at Cornell, I took elective courses at Cornell’s Veterinarian College, to increase my knowledge of horses. During my 30 years of employment with Chemung County, I obtained my NYS Professional Engineering License, as well as obtaining top NYSDEC certifications in Wastewater Treatment and Landfill Operations. For several years, for Corning Community College, and NYSDEC, I instructed wastewater treatment plant operator certification courses. 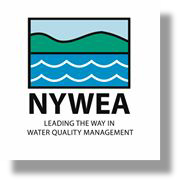 In 1994, I was elected as President of the New York Water Environment Association, and also became that organization’s “Operator in Chief” of the Select Society of Sanitary Sludge Shovelers and in later years, represented NYWEA at the international level on the Board of Directors and the Executive Board of the Water Environment Federation. In 2006 I was awarded the Woman of Distinction honor by the New York State Senate. 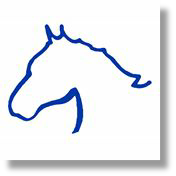 I retired from my position of Director of Environmental Services for Chemung County in 2009, and now can devote my full interests towards my life-long horsewomanship at my beloved horse stable, Gale’s Equine Facility.